m into flower. There are two good lessons to learn here one is that one should never take a plant name for granted - always confirm the identity when it is in flower. In my defence I would have known that it was not N. serotinus as soon as the bud started to mature and open even though I failed to recognise it at first. The second lesson is to make sure you collect all the seed from bulbs before the capsule splits and the seed is shed into the adjacent pots. I have to hold up my hand and admit that I am guilty of not collecting all the seeds quickly enough and have many a stray narcissus seedling appear. Thanks, Guys, I really appreciate the benefit of your experience. The days are really shortening now as we are deep into November and the cold damp weather is never far away. 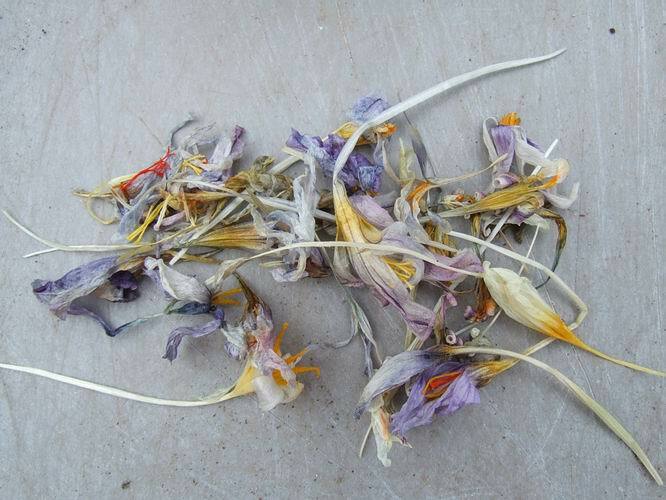 It is very important to remove all the dead flowers especially from cyclamen and crocus before they become infected with mould. In bright sunny days the spent crocus flowers can quickly become dried out but as soon as the dampness returns they absorb moisture like a sponge. 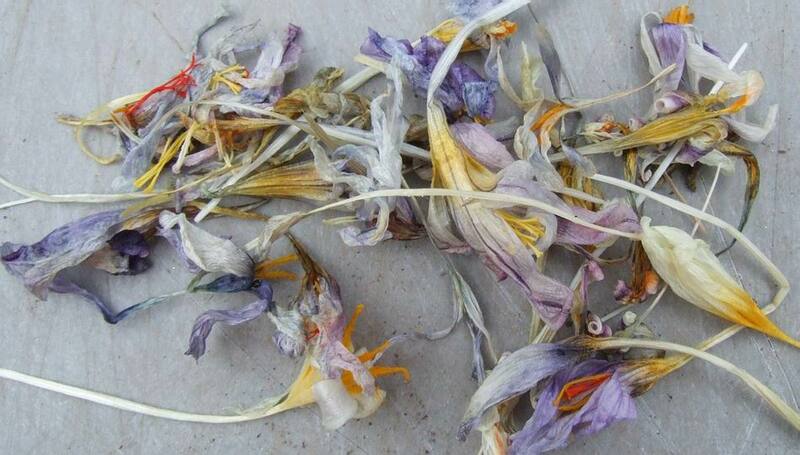 It only takes a short time to go around and carefully pluck the flowers off with a sharp tug. It is also good control as you have to look carefully at the plants when you are removing the flowers so you do not accidentally pull off any leaves - at the same time you can see if there are any signs of aphids or other problems affecting the plants. I am always struck by how pretty the dead flowers can look when piled into a container - not as nice as they do when they are at their peak but still another pleasure before they disappear altogether. 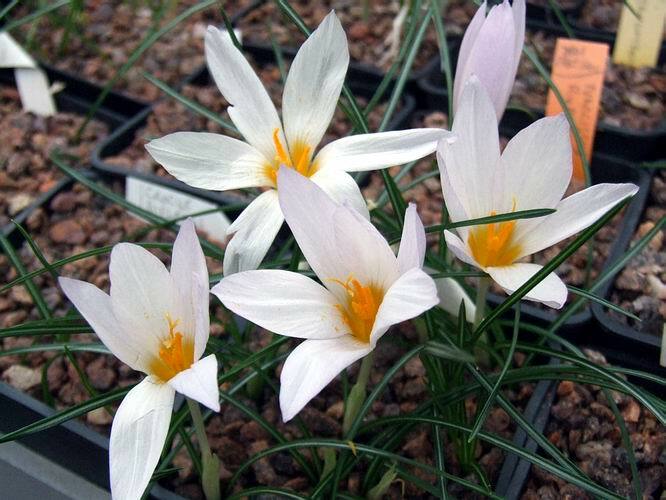 Many of the crocus produce a second or even third flush of flowers. The second flowers on some species appear just after the first one opens so they can both be in flower at the same time while others produce the second flush after the first ones have passed away completely. Crocus caspius falls into the latter group as I removed the first flowers a week or two ago and now I have another set of blooms. 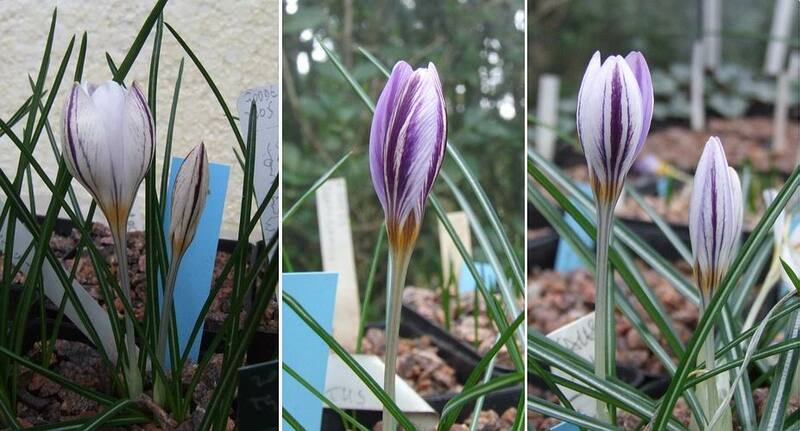 Crocus laevigatus is an incredible species as it can flower in the autumn, winter or spring. I have many pots of seedlings of it and as well as the time they produce their flowers they also have an incredible variation in markings. 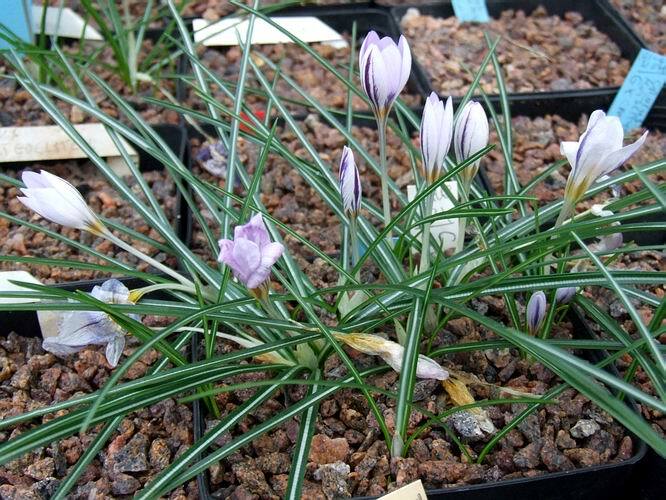 When it comes to flowering period Crocus laevigatus is probably the best value I grow - it is easy to please, produces plenty seeds and flowers over such a long time. 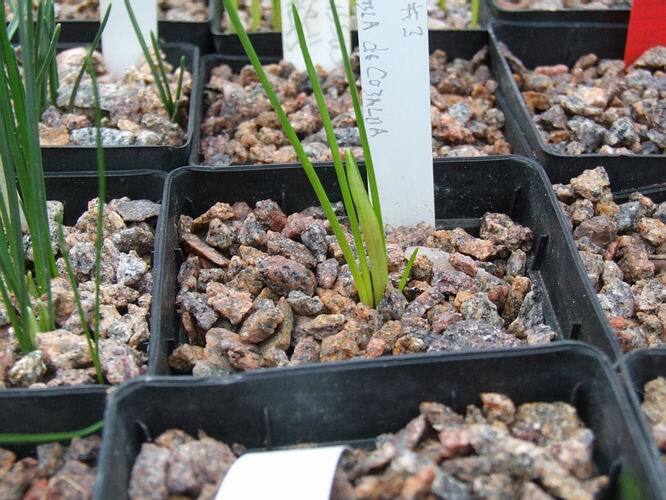 To obtain this variation in colour and flowering time you will need a number of seed raised forms. If I had more space under glass I would like to grow more cyclamen. Many years ago I decided that due to lack of space we had to rationalise what we grew under glass and one of the genera I chose to cut back on was the cyclamen. I planted most of the cyclamen we had been growing in pots into the garden and most of them are still surviving even though they are not all doing that well. However I cannot stop loving them and I keep sowing seeds and here is a first flower on this Cyclamen cyprium. As well as finely marked leaves what a beautiful scent the flower has. 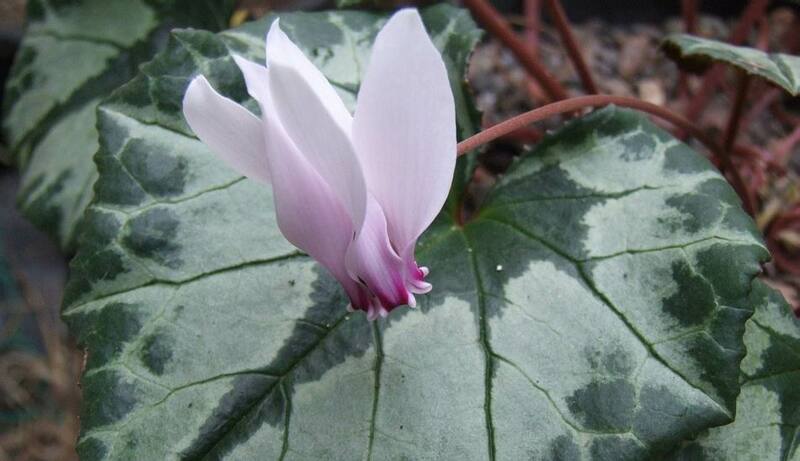 A big flowered form of Cyclamen africanum, a seedling from Sandy Leven's multi-Forrest Medal winning plant, is still in a big pot in the bulb house. I had ambitions to beat Sandy at his own game one day and win the autumn Forrest Medal with it (note the past tense). 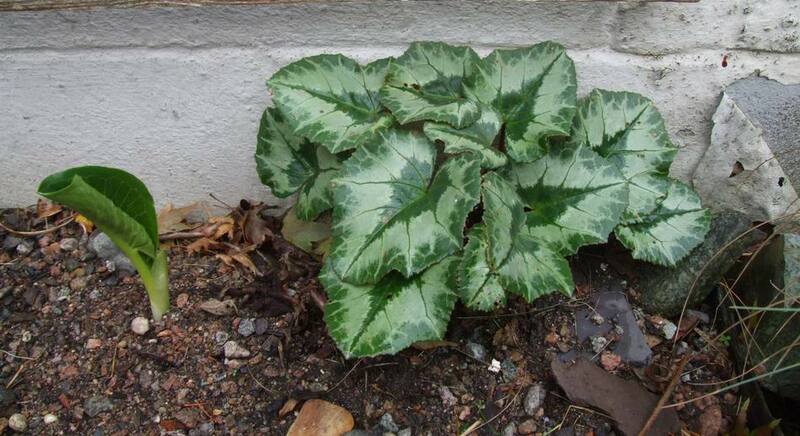 There have always been some doubts over whether this plant is true Cyclamen africanum or not. Sandy got the original from Jim Archibald and it is certainly different from C. hederifolium. 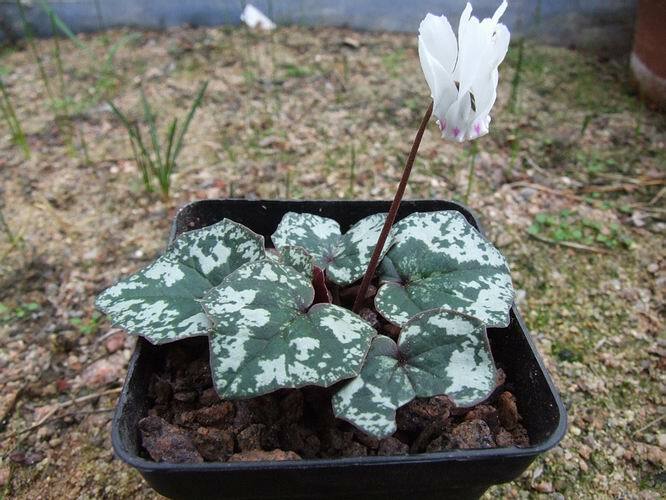 I have heard it said that the best way to tell the difference between Cyclamen africanum and hederifolium is to put it outside and if it survives the winter cold then it is hederifolium - I cannot agree with that test as a way to distinguish a species. However we do have a sister seedling growing happily outside in a south facing bed - the leaf to the left is Arum creticum. 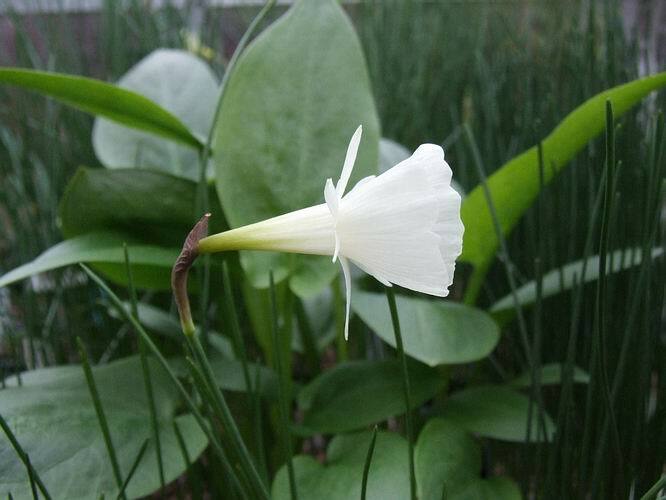 Among the cyclamen that have been creeping back into the bulb houses are two forms of Cyclamen persicum which unlike C. graecum do produce plenty of flowers for us every year. 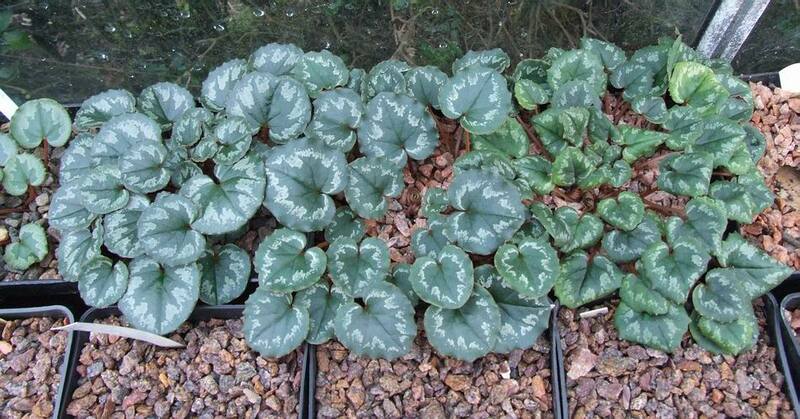 Cyclamen mirabile is another that I must have under glass as it is possibly my favourite of them all. Can you notice the difference between these three plants? The one on the right is looking quite yellow and sickly compared to the other two and if you could feel the leaves you would find that they are very limp while the other two have firm leaves - for some reason it has not been getting enough moisture. My first reaction was to give the leaves a bit of a pull to see if they were well attached to the corm - rot can often start to form where the stems rise from the corm and if that is the case the leaves would come off in my hand. Another possibility is that there is a problem at the roots - it could be rot or it could be something is eating them - but then the corm would move when I tugged the leaves. I now conclude that for some reason I have just missed out this plant when watering and it is just a shortage of water. I placed the plant in a tray of water for an hour and now I hope that it will perk up. 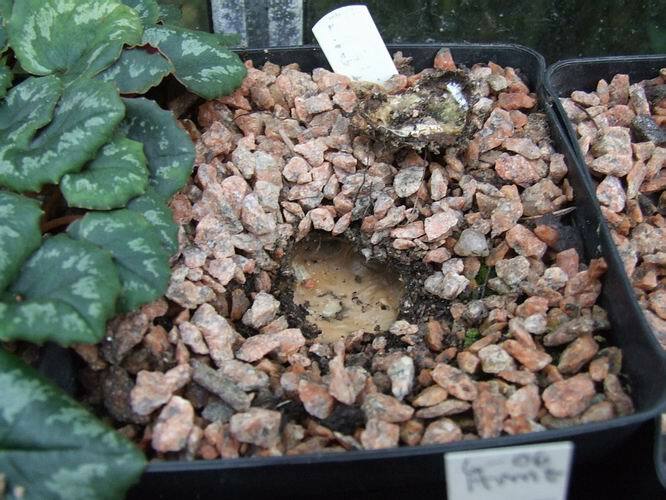 One big disappointment is the loss of my only plant of Cyclamen parviflorum which has just rotted away and I am at a loss to know why. I have grown it successfully for a number of years and to lose it now is a big blow. 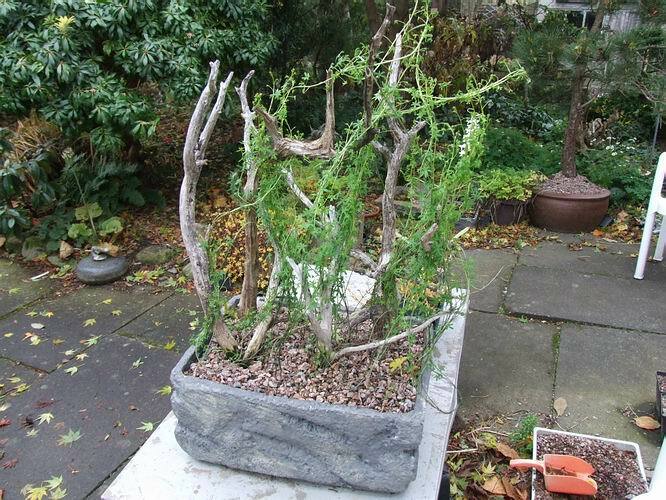 I have had this fish box trough of Tropaeolum tricolorum outside since the summer to take the rain but I will have to find somewhere for it to go under glass before the frosts start. While it is frost hardy, it is like so many plants, it cannot take hard frosts when the soil is very wet. 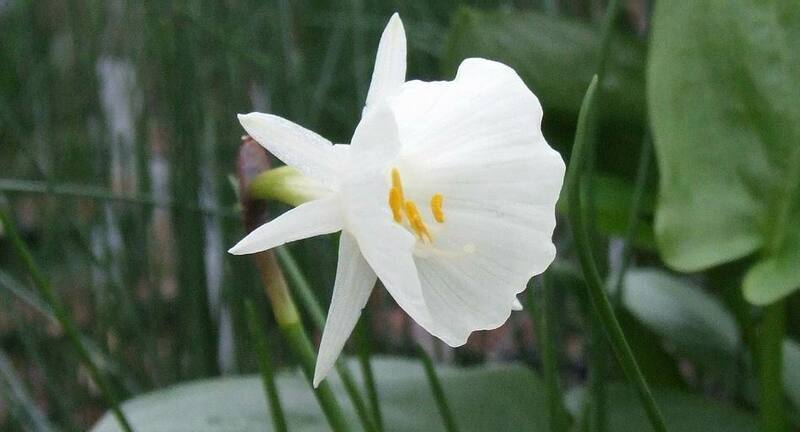 Another Narcissus has opened its flower, this time it is Narcissus cantabricus foliosus. Last year it opened its first flower on the 25th October and I showed it in log 44. My extensive picture files for the bulb log are a great record of when things flowered and it is amazing how often it proves that when you think (remember) a plant flowered last year and when it actually did are not always the same. I will be back at the same time next week - I think! !